What’s the latest in materials forecasts for ALD/CVD precursors, CMP consumables, electronic gases, silicon wafers and sputtering targets? Techcet gives us an update. 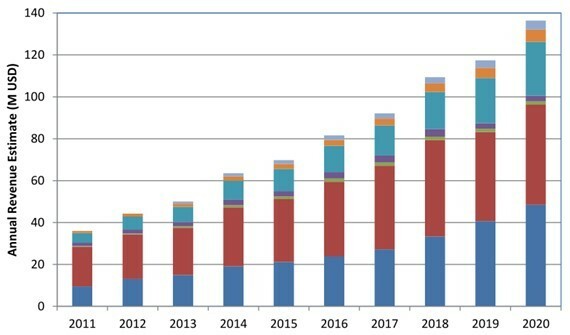 Use of front-end Ta and W metal gate and Hf gate dielectric precursors will grow over 2.5x by 2020, according to a new report from Techcet, “2015 ALD/CVD High K and Metal Precursors for the Semiconductor IC Market.” The overall precursor market sits at $185 million today, and is expected to grow 18% over the next five years. The advanced metal gate and gate dielectric segments within that market are expected to grow at 168%, more than compensating for the 25% decline anticipated for the high-K memory precursor segment. The 2014 market size for CVD/ALD precursors for interconnect applications was approximately $93 million, up 19% over 2013. This year is forecast to be up another 15%. By 2016, growth in this segment will be dominated by cobalt barrier precursors, as WF6 for contact and plug applications begins to decline. The 5-year CAGR for this area is forecast to be 9.4% overall. The precursor market for capacitor CVD/ALD applications, which includes DRAM and a variety of memory devices, is expected to be flat for the next 5 years, fluctuating in the range of $55 million to $70 million. The difficulties in forecasting conventional memory demand are compounded by the emergence of a host of new memory device structures, not all of which depend on these materials. The semiconductor CVD/ALD industry utilizes precursors for more than 29 different metals and metal oxides provided globally by 23 suppliers. In addition to market analysis, process flow details, precursor candidates and critical supply chain issues, the report includes regional ranking for major suppliers of vapor deposition precursors. The global CMP consumables market volumes continue to grow faster than semiconductor volumes as additional CMP process steps are added in each device generation. At more than $2.0 billion for all CMP consumable segments, 2014 CMP slurry and pad revenues are up 6.0% over 2013, and are projected to be up an additional 4.3% in 2015, according to a new report from Techcet, “CMP Consumables 2015 Critical Materials Report.” From 2017 to 2020, revenues are expected to continue growing at about 5% as polishing layers become thinner, slurry flow rate decreases, pad life increases and slurry pricing pressure increases. Fig. 2: CMP slurry and pad revenue trend and forecast, 2013-2020. The market share of Cabot Microelectronics, the historical slurry market leader, continues to be stable at just over 36% globally. Aside from Cabot, market ranking for 20 other slurry suppliers can be identified only in the context of a specific process application, as each segment functions as an independent market. This results in a fragmented slurry market with a half-dozen major suppliers, each with a significant market share in at least one process area. The pad market is still led by Dow Chemical with about 78% share globally. Cabot Microelectronics shares the Tier 2 pad group with Fujibo and NexPlanar, with an estimated 4% to 6% share each. Defect reduction requirements and tighter specs on removal uniformity continue their relentless march to planarization perfection in order to satisfy the demands of device manufacturing below 20nm. The 3M slurry-free fixed abrasive pad has been determined to be unable to keep up with defect demands below 20nm, and is undergoing an orderly withdrawal from the market. TSV, 3D integration and vertical NAND devices are providing new opportunities for CMP market growth, but will not be enough to turn the overall revenue projections positive. The 2014 market for electronic gases totaled $3.5 billion, up 5.8% over the prior year, according to a new report, “2015 Electronic Gases Market Report – A Techcet Critical Materials Report.” The 2015 outlook is for 6.2% growth overall, with the electronic specialty gases segment leading the way with 6.5% growth to $2.4 billion and bulk gases increasing 5.8% to $1.3 billion. Though electronic gas revenues are expected to continue growing at this pace, supply and demand issues affecting NF3, WF6, xenon and neon are expected throughout the year. Fig. 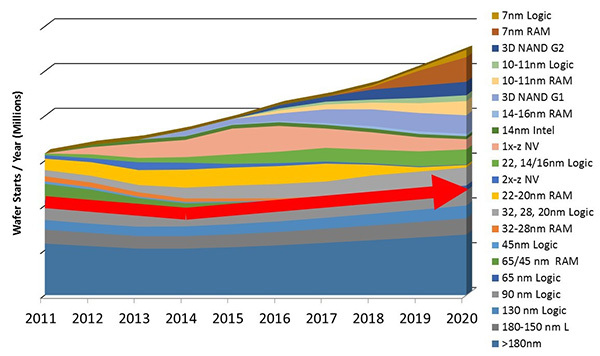 3: Electronic gas trend and forecast 2010-2015 (Specialty and Bulk Gases). Helium supply is stable for now, as the U.S. Bureau of Land Management began selling to the commercial market at the end of 2014. Nitrogen trifluoride supply remains tight, while suppliers wait to see who jumps in first to build more capacity. WF6 is in a similar situation, although demand has been growing steadily. Xe and Ne both face tight supply exacerbated by instability in the Ukraine. In bulk gases, Air Products and Air Liquide share the market lead with 32% and 28% share respectively. In specialty gases, Air Products has a comfortable 7 point lead over Air Liquide though each is over 20% share. Praxair, Linde and TNSC-Matheson round out the other global share leaders. The 2014 market for semiconductor silicon wafers totaled $7.6 billion on 10,089 MSI Si, up 1% from 2013 but still well below the 2012 level of $8.7 billion, according to a new report, “Silicon Wafers for Semiconductor Device Processing 2015, a Techcet Critical Materials Report.” The 2015 outlook is flat at $7.6 billion despite a 3% increase in MSI Si. Total wafer starts (200mm equivalent) are projected to increase by 50% over the next 5 years, but Si wafer revenues will not keep pace. Fig. 4: Silicon shipment trend and forecast by node and product type. Source: Techcet. Forecast based on information from SEMI, VLSI, Gartner, and others. Although shipments of silicon by area recovered after 2009, prices have still not recovered to 2008 levels. Silicon area shipments were relatively flat from 2010 through 2013 before rising 10% in 2014. Meanwhile, silicon revenue peaked in 2010-2011 before declining sharply in 2012 and 2013 to begin a 3-year flat stretch. Silicon wafer pricing is expected to remain level through 2015 and 2016 if the current demand assumptions hold. SOI wafers enjoyed a price increase in 2014 due to a temporary supply-demand imbalance, but prices will stabilize through 2015 as new capacity comes online. The timeline for 450mm wafer pilot has been pushed out to 2019. While Intel remains bullish, TSMC and Samsung have not yet joined the 450mm investment track. As a result, only S.E.H. and SUMCO have invested in 450mm development to date. The top 5 silicon wafer producers account for roughly 97% of bulk wafers sales. Shin Etsu Handotai (S.E.H.) and SUMCO account for over 60% of volume and revenue among the two of them at 32% and 29%, respectively. There is no evidence to suggest that Chinese manufacturers are positioning themselves to capture greater market share. Soitec dominates the SOI wafer market with 60% share of 300mm SOI and 50% share of 200mm SOI. S.E.H. has a 30% share of each, with SunEdison capturing the remainder. 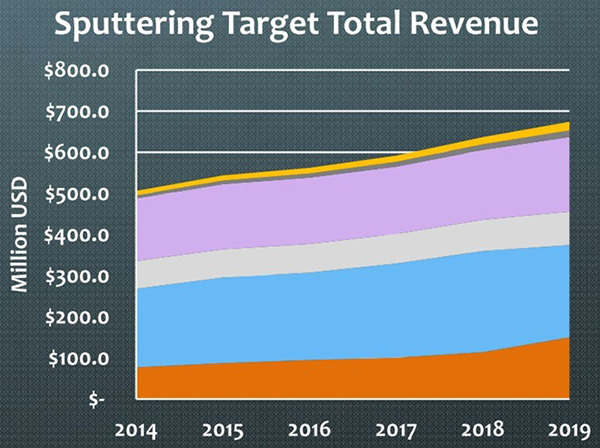 The 2014 market for semiconductor sputtering targets totaled $506 million, up 3.8% from the prior year, according to a new report, “2015 Techcet Critical Materials Report on Sputtering Targets for Semiconductor Device Applications.” The 2015 outlook is for an additional 6.7% growth to $540 million, with tantalum driving 38% of the revenue from only 15% of the unit target shipments. The estimated CAGR of 5.5% will bring the market to a projected $662 million by 2019. Prices for Ta and W will continue to be heavily leveraged by raw materials cost and recycling. Prices for Cu, Ti and Al will be more strongly influenced by target fabrication costs. Penetration by Chinese target suppliers will provide additional pricing pressure to an already stressed market. The market for Ta targets is expected to decrease as 7nm logic devices ramp in production, as these products are expected to shift to CVD/ALD barriers. No material supply or price disruptions are anticipated during the forecast period. The semiconductor sputtering targets market is dominated by JX Nippon at 55% share, followed by Honeywell Electronic Materials, Tosoh SMD and Praxair. Chinese suppliers Grikin and KFMI are gaining share primarily at the expense of Praxair and Tosoh. Michael Fury works for Techcet CA, LLC, a technology-centered Materials Market Research and Consulting company serving the Semiconductor, Display, Photovoltaic, and Printable Electronics markets. For more information, please visit www.techcet.com. The SEMI Chemical and Gases Manufacturers Group is a special interest group of SEMI made up of members who produce, package and/or distribute chemicals or gases used in micro-electronics applications. CGMG is the driver behind a number of materials-related initiatives, like the Strategic Materials Conference and materials events at the various SEMICON events, and guides SEMI on materials-related issues. To join (or for more information) on the Chemical and Gases Manufacturers Group, please contact Tom Salmon ([email protected] or call 408.943.6965). Attend the SEMI Strategic Materials Conference on September 22-23 at the Computer History Museum in Mountain View, Calif. This year’s theme, “Materials for a Smart and Interconnected World,” will take a broad look at what is driving the demand for new materials, how material suppliers are being impacted by the value chain they serve and how this affects the smart and interconnected world we live in.